Lactic Acid once or twice? Bike ride home from work (45 minutes), then 45 minutes of strength training. I have pretty low heart rates during the bike ride, but I still feel my hamstrings the next day. Interesting. My next race is the Czech Long Distance Championships on April 9. It’s a 6km head race in Hořín, just north of Prague, and I will be starting as a lightweight in the open category. My training schedule is geared to that race. I am now in the second (heavy) week of a 4 week meso cycle, after which I start a 6 week meso cycle leading up to the race. For rowing, I think hard distance workouts and things like 2x4000m or 2x3000m with 1 minute rest (for turning the boat) would qualify perfectly. Alternatively, time based intervals with short rests could be done, with longer rests in the beginning, and shorter rests closer to the race date. 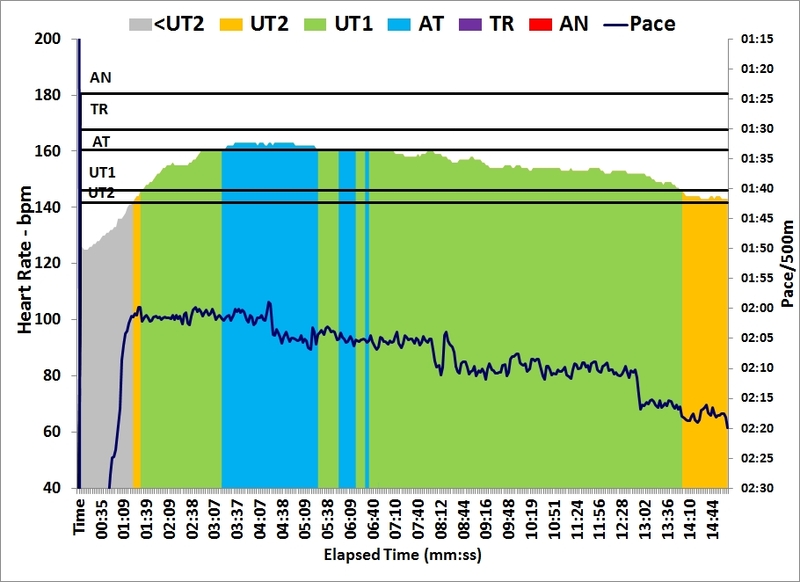 I have quite good results from doing a weekly 2x3000m OTW, with a 1min rest for turning in the weeks before a head race. Today it was going to be a single 30 minute. And to make it more interesting, I was going to make it a PB attempt. A year ago, I managed a PB of 7986 meters, so this time I was going to attack the 8km barrier. Still, the hamstrings were a bit tired. This is a heavy week. Well, so be it. 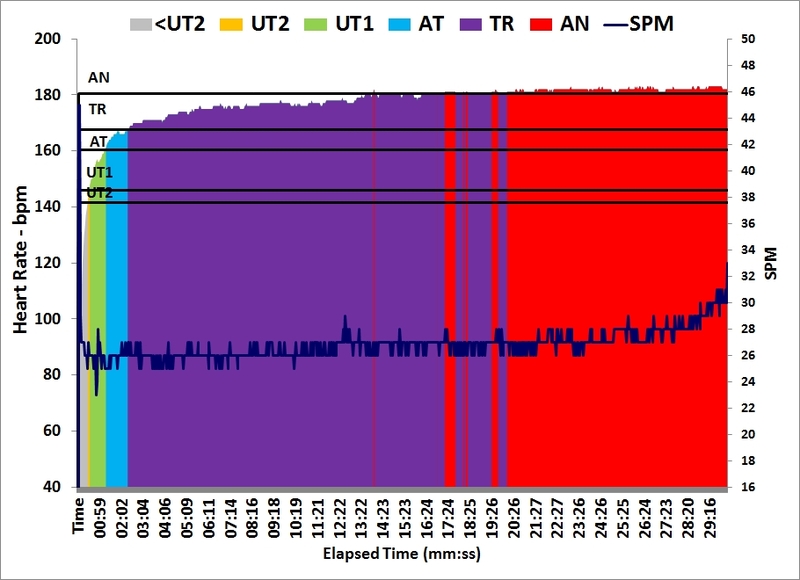 The 30 minute trial is not a super important test for me, even though it is quite often used as a test of lactate threshold heart rate. Then on to the main event. 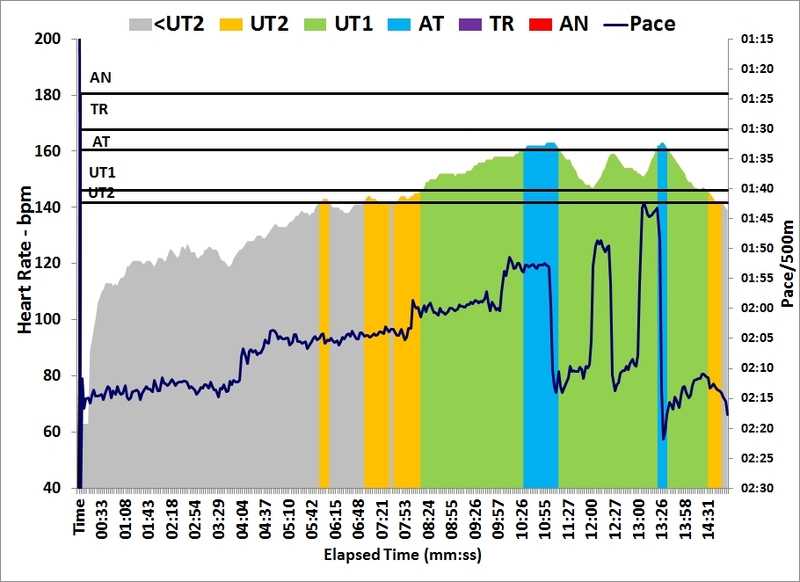 I was hesitating between flat pacing at 1:52.5 and negative split, starting at 1:53.5. In the end I decided to flat pace (just as a year ago). 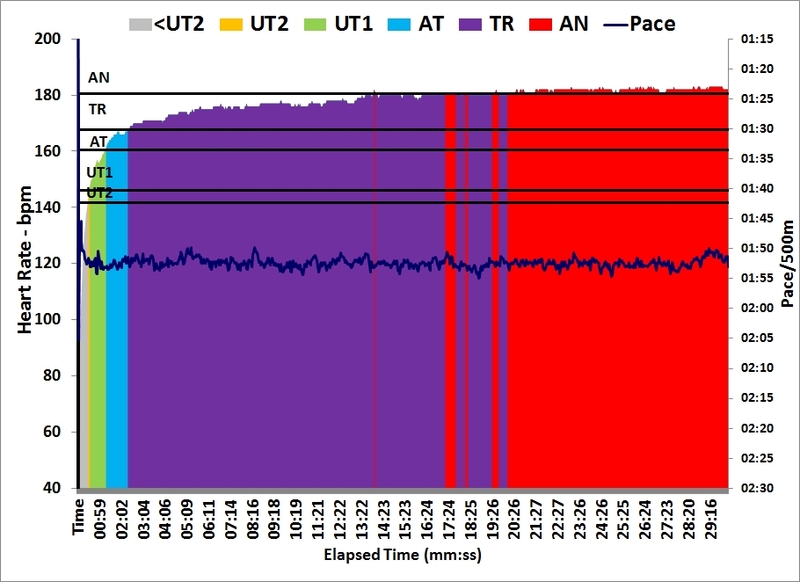 I set up a pace boat in RowPro at 1:52.5 and also loaded my PB row of a year ago. It is amazing how much time is left of a 30 minute row when it starts to hurt. In the beginning I was pulling away from “2015 Sander” and the pace boat, rowing about a virtual length and a half in front of them. Then “2015 Sander” started to accelerate and took the lead. However, I knew that “2015 Sander” had a crisis in the third quarter of this row, so I let him go. He was never more than 10 meters ahead of me. In the mean time, as my average pace was 1:52.2, I allowed it to drift up a bit to 1:52.5, then tried to pull away from the pace boat. That helped and I needed it until 1 minute to go, seeing more 1:53 strokes than 1:52 strokes. Pace boat was 5 meter behind me, “2015 Sander” had dropped a few more meters and was 17 meters behind me. Only in the last minute was I able to get the pace down and pull 1:51. No real sprinting. With 2 seconds to go I passed the 8000m mark and couldn’t help but shout “Hey!”. That hurt! But it’s a new PB, and a >900 nonathlon points row. I didn’t measure lactate, because I couldn’t imagine pricking my finger after such a hard row, but from the pain and from my lactate curves it must have been way above 10 mmol/L. Would be interesting to test it next time. So, filled up with lactate I cooled down for 15 minutes. On top of that, it has a pH of 3 and is full of lactic acid. Not sure if that is good, when I already had my own produce in my muscles, but who cares. It tastes good, and seems to be excellent food for lightweights. Final thought: I rowed 8km at an average pace that was identical to my 6k test in the fall. That doesn’t sound too bad, given that I am doing a 6k test next week.